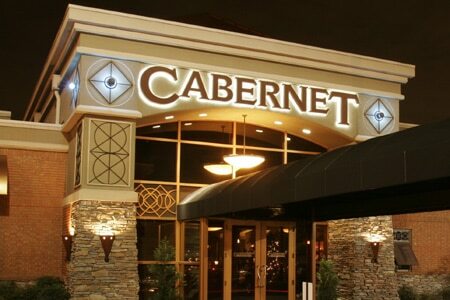 Posh and professionally staffed, Cabernet does steak, seafood and even veggies all with style and taste. : Although seafood is important on this menu, Cabernet is basically all about meat. The striking, freestanding building with a curved (and noise enhancing) ceiling, balconies and a handsome traditional bar of dark wood, brass and marble is a guy's club haven. The steaks, chops and prime rib are all on the money. The rich, silky lobster bisque raises the bar on the genre. But snails in puff pastry and crab cake with beurre blanc are worthy as starters as well. Although the tuna tartare is fresh tasting and properly minced, the heat factor on the seasoning is over the top---especially for wine. The lamb lollipops, crumbed and baked, serve as a rich introduction to more meat. Don't want to be stuck on steak for lunch? Consider the chicken Caesar wrap, half of which likely will go home with you for another meal. Veggies here are topnotch, and can be used to compose a splendid plate. Go doubles on the grilled asparagus, as everybody will want some. Salads, though, seem overdressed and the greens cut rather than torn. Hash browns are closer to cottage potatoes, but still tasty. On Fridays and Saturdays, a prix-fixe $35 meal includes a glass of wine. The wine list is extensive, and the restaurant has a wine room and a full bar. New York-born executive chef Richard Holley has a keen eye for what works in a suburban steakhouse.